Fenside House01263 715779work01603 870304fax Self-cateringFenside House is a large detached bungalow with a river frontage leading onto Barton Broad. Built in the late 1960's the property is very spacious, with a lovely decked area with outdoor seating and barbecue perfect for alfresco dining. This a lovely property for families and groups of friends with lots of space to spread out and relax. Luxuries: Flatscreen TV with FreeSat, Blu Ray DVD player, iPod Dock. Outdoors: Grounds extending to three acres, lawn, leading to mooring, not visible from property. Play house and trampoline. Large enclosed decked area with table, chairs and gas barbecue. Water is from a well, filtered water to kitchen tap. Children should be supervised due to open water. Access: Driveway space for up to six cars. Property is approached along an unsurfaced single track lane that runs at side of fen, this can be very muddy and uneven depending on time of year and weather conditions which may not be suitable for cars with low suspensions. 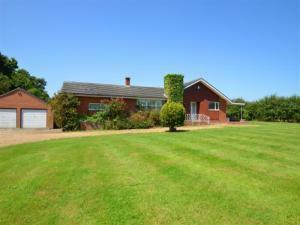 Fenside House is a large detached bungalow with a river frontage leading onto Barton Broad. Built in the late 1960's the property is very spacious, with a lovely decked area with outdoor seating and barbecue perfect for alfresco dining. This a lovely property for families and groups of friends with lots of space to spread out and relax.